PRESIDENT Lungu has invited French businesses to partner with Zambian entrepreneurs in the value addition chain because Zambia is one of the best investment destinations in the world. The President said yesterday that Zambia has a conducive investment environment because of its political stability and competitive economic policies. He was speaking in Paris, France, at the opening of the highly respected Movement of French Enterprises (MEDEF)-Zambia Business Forum at the MEDEF Building on Avenue Attendees. “Zambia is among the best investment destinations in Africa. I am, therefore, appealing to members of MEDEF International to seriously consider partnering with Zambian businesses in the value addition sector,” President Lungu said. The meeting is a follow-up to the high-level visit to Zambia in June last year by 25 business executives and investors from prominent French companies. Representatives of 60 French companies were in attendance. MEDEF International is the umbrella body for the private sector in France with investments in various parts of the world, including Africa. President Lungu informed the investors that Zambia has established multi-facility economic zones to promote value chains and invited them to travel to the country and identify areas of interest. The President said there are abundant opportunities for investment in value addition in agriculture, mining, energy and other sectors. 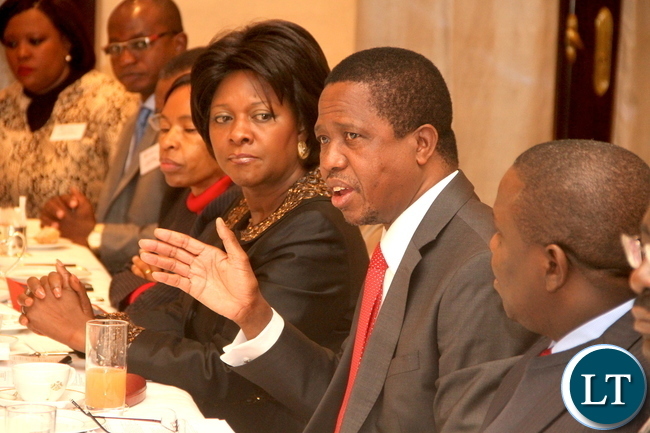 President Lungu described Zambia as a gateway to the African market. Mr Lungu is happy that 20 French companies are already operating in Zambia including Lafarge International, Total and Africa Logistics. The President said Zambia has continued to enjoy high rankings by international rating agencies including Forbes, which rated the country as the fourth most competitive in the ease of doing business in Africa. President Lungu hailed the increase in the value of trade between France and Zambia from US$24 million to US$53 million between 2012 and 2014. He said Zambia is a politically stable country which upholds the rule of law and holds peaceful, free and fair elections. The President assured the investors that the August 11 tripartite elections will be peaceful. “Come and witness democracy in Zambia,” he challenged the investors. President Lungu said his Government will continue to uphold constitutionalism. He thanked French President Francois Hollande for inviting him to visit the European country. President Lungu said his visit and the business forum will further strengthen bilateral relations between the two countries. And MEDEF International Africa committee vice-president Gerard Wolf thanked President Lungu for accepting the invitation to attend the MEDEF-Zambia Business Forum. And Zambia’s Ambassador to France Humphrey Chibanda commended MEDEF International for working closely with the Zambian embassy in Paris to promote French investment in Zambia. French Ambassador to Zambia Emmanuel Cohet described President Lungu’s visit to France as a turning point in the bilateral relations of the two countries. President Lungu was accompanied by Minister of Foreign Affairs Harry Kalaba, Minister of Commerce, Trade and Industry Margaret Mwanakatwe, Minister of Energy and Water Development Dora Siliya, his special assistant for press and public relations Amos Chanda, heads of selected parastatal companies and other aides and immediately went into the meeting venue. And according to a statement issued by special assistant to the President for press and public relations Amos Chanda, after the MEDEF main plenary session, the President met representatives of selected French companies investing in Zambia for specific representations. Among the key ones were Lafarge Cement, Airbus, the giant aircraft maker, Itron, a leading water company, and Syndicate des Energy Renewables which facilitated a special session on energy investments into Zambia. He said Itron Limited offered to invest into the rehabilitation and management of the water sector in order to cut leakages from the current 60 percent to 30 percent within five years. The President was later last evening expected, to attend interviews with France 24 TV and Radio France International. He assured the investors that their investments would be safe. “You will never worry about your investment in Zambia, as our recently enacted constitution and other legislation continue to protect property rights and prohibits unilateral expropriation of private property. Let me also assure you that our judiciary provides fair adjudication of commercial disputes and ensures that the enforceability of contracts is a reality,” he said. President Lungu said Zambia is a pioneer in the promotion of private sector investment due to its very liberal economic policies such as liberalised foreign exchange regime; ease of externalisation of profits; competitive energy tariffs, and availability of suitable labour force, among others. Investments being safe? Is it not PF that grabbed back ZAMTEL from Lapgreen? We understand the case is likely to be settled in favor of Lapgreen and the taxpayer will end up paying US$800m. Is it not PF ministers (Yaluma, Musukwa, Kambwili, etc) working with jerabos who have made it impossible for Nkana Alloy to operate at the Black Mountain? Also when they sue, Zambian taxpayers will pay! Walk the talk! Now this time Mumbi Phiri not in the picture.Did she go around shopping? In the interest of non-partisanship, ECL is showing us a UPND symbol. Go ECL. Ask UPND/HH to form an alliance in the forthcoming elections. This would easily defeat MMD and DF. ECL CAN’T BE IN ALLIANCE WITH ABA PUPU. ECL IS CLEAN. IN FACT ECL DOES NOT NEED AN ALLIANCE WITH ANY PARTY. THE ALLIANCE ECL NEEDS IS WITH THE PEOPLE OF ZAMBIA THROUGH DEVELOPMENT. THIS IS VERY GOOD MARKETING MR PRESIDENT. NOT THOSE PARTY PRESIDENTS WHO COME HERE ONLY TO COME AND DESPISE THEIR COUNTRY FOR WHICH THEY WISH TO BE PRESIDENT. ZAMBIA MUST BE KNOWN TO ALL THAT IT IS A PEACEFUL COUNTRY AND IT’S ZAMBIANS THEMSELVES WHO SHOULD MARKET ZAMBIA. IT IS BEING DAMN STUP1D FOR ONE TO GO ABROAD/OVERSEAS ONLY TO TALK ILL ABOUT HIS COUNTRY FOR THE SAKE OF OUTSIDE HELP.